Everyone talks about ‘motivation’ – the purpose of this post is to briefly track the key concepts and theories. The framework for modern management is firmly rooted in the concepts of scientific management developed during the industrial revolution, formalised by Frederick Taylor and the Gilbreths. Workers were closely supervised, the method of working designed in detail (time and motion studies) and payments were based on work accomplished (piece rates). Where piece rates were not practical, supervision was intensified. 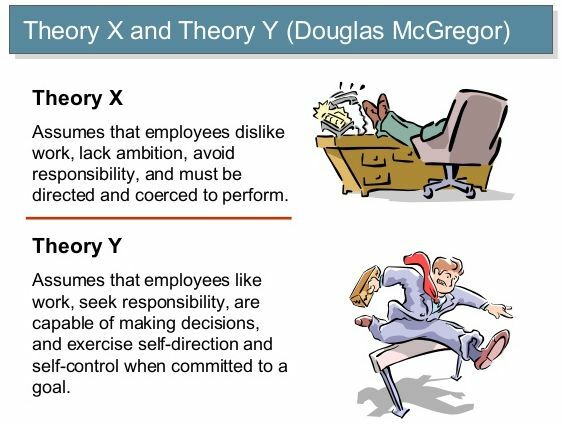 This approach aligns with ‘Theory X’ developed by Douglas McGregor in the 1960s, in which managers believe individuals are inherently lazy and unhappy with their jobs, and as a consequence an authoritarian management style is required to ensure fulfilment of objectives. The first steps towards McGregor’s ‘Theory Y’ (which assumes given the correct leadership, employees can be ambitious, self-motivated, exercise self-control and are willing to take on some amount of professional responsibility to achieve the objectives) came from the work of Henry Gantt. One of the first people to develop a true motivational theory was Abraham Maslow. 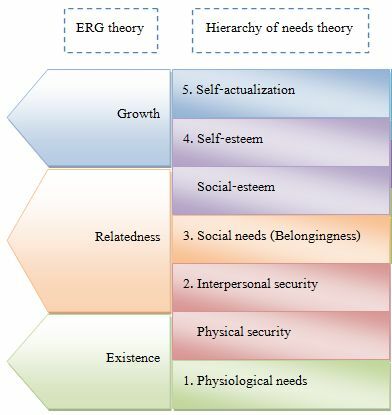 In his 1943 paper “A Theory of Human Motivation”, Maslow states the five levels of the hierarchy of needs as Physiological, Security, Social, Esteem, and Self-actualizing. Physiological needs are described as those needed for survival such as food, water, and sleep. Security needs include safety, steady employment, and shelter from the environment. Social needs include the need for love, affection and being part of a team or group. The need for esteem is centred on the individual’s personal worth, social recognition, and accomplishment. The highest need is self-actualization, which is where the individual is less concerned with other’s opinions and is more focused on achieving their full potential. A point worth noting is that Maslow stated that the predominance of a need assigned by the individual determines its’ importance not the order presented. This point is brought up because Maslow’s theory is commonly represented as a pyramid and the assumption that the first need must be satisfied before the next need is even addressed. Vroom developed his Expectancy theory (1964) through his study of the motivations behind decision making. It proposes that an individual will decide to behave or act in a certain way because they are motivated to select a specific behaviour over other behaviours due to what they expect the result of that selected behaviour will be (ie, their expectations based on pervious experience or observation). 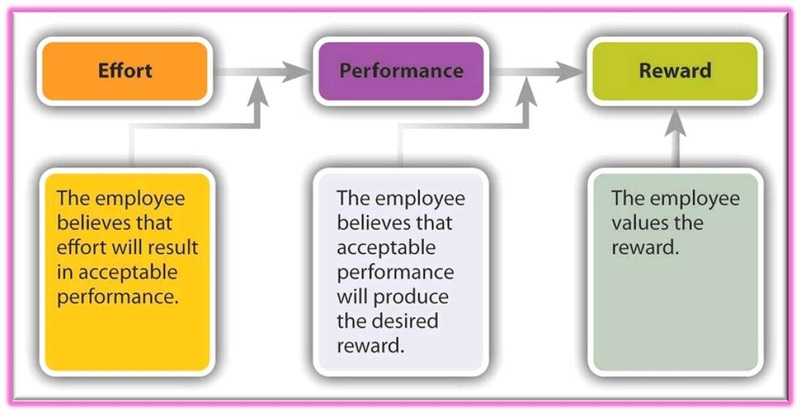 This theory emphasises the needs for organisations to align rewards directly to desired performance and to ensure that the rewards provided are both deserved and wanted by the recipients. Herzberg (1965) theorized that satisfaction and dissatisfaction were affected by different factors and thus could not be measured on the same scale. This theory is known as the two-factor theory; Herzberg’s motivation-hygiene theory; and/or the dual-factor theory. Hygiene factors are those that pertained to the job and were comprised of supervision, interpersonal relationships, work conditions, salary, and company policy. Hygiene factors cannot produce motivation only satisfaction or dissatisfaction. The motivational factors are such items as recognition, a sense of achievement, growth or promotion opportunities, responsibility, and meaningfulness of the work itself. 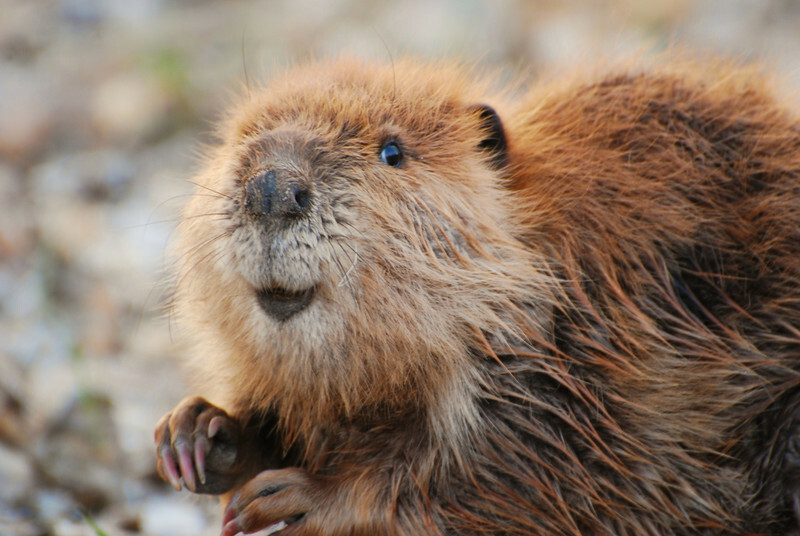 Hygiene factors need to be removed (cleaned up) before motivation factors can take effect. This theory was developed in the same timeframe as McGregor’s ‘Theory X – Theory Y’. Achievement discusses how people with different levels of achievement needs seek tasks with a corresponding level of risk. The higher the achievement need the higher the risk. Affiliation need is similar to achievement and differs only in the fact it is the need to be associated with or accepted by a specific group. 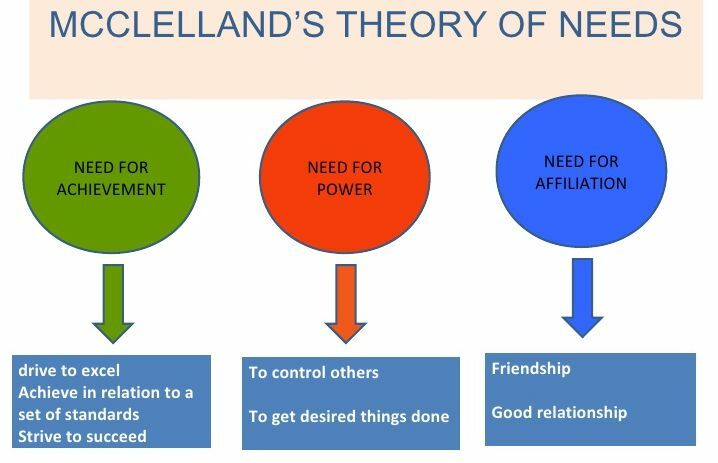 The power portion of the needs theory actually has two sub-sets, personal power and institutional power. Personal power describes the individual who wants to direct others and institutional power describes the individual who wants to organize the efforts of others for the betterment of the institution. Existence needs- These include need for basic material necessities. In short, it includes an individual’s physiological and physical safety needs. Relatedness needs- These include the aspiration individual’s have for maintaining significant interpersonal relationships (be it with family, peers or superiors), getting public fame and recognition. Maslow’s social needs and external component of esteem needs fall under this class of need. Growth needs- These include need for self-development and personal growth and advancement. 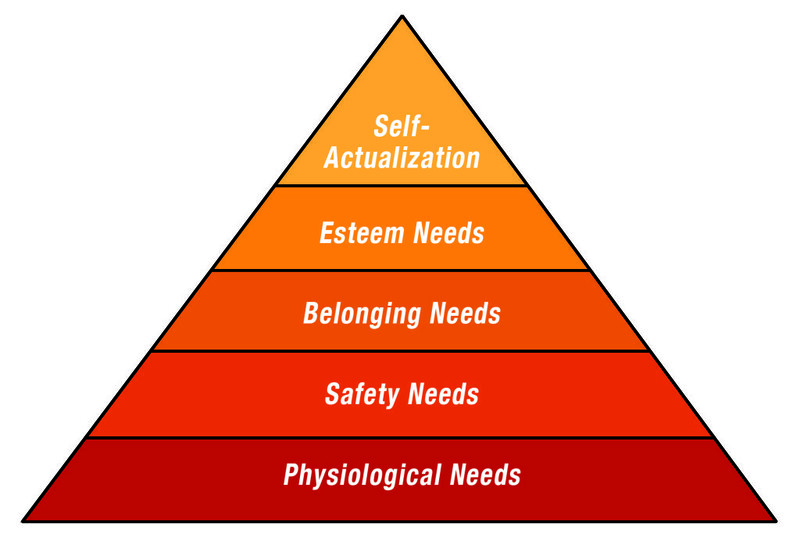 Maslow’s self-actualization needs and intrinsic component of esteem needs fall under this category of need. ERG Theory states that at a given point of time, more than one need may be operational and recognises the option for both advancement and frustration/regression. Theory Z (Ouchi): High levels of trust, confidence and commitment towards the workers on the part of management lead to high levels of motivation and productivity on the part of workers (based on observation of Japanese businesses in the mid 1970s – Ouchi suggests that when selecting a person for promotion to a different role [eg, a manual worker to foreman] it is better to select a person with a demonstrated commitment to the objectives of the organisation in preference to the most effective manual worker, the current demonstrated capabilities are not relevant and commitment overcomes obstacles). Contingency theory (Morse & Lorsch): People need to develop a sense of competence and this need continues to motivate people after competence is achieved. A good fit between the organisation’s structure and the task leads to competence, creating motivation. Goal-setting theory (Latham & Locke): Having clear, specific and challenging goals motivate people. Reinforcement theory (Skinner): Human behaviour is shaped by the previous positive or negative outcomes experienced by a person as a consequence of an action. Only positive reinforcement (rewards) should be used to encourage desired behaviours. Equity theory (Adams): People are motivated by their desire to be treated equitably. Perceptions of unfair allocation of rewards can lead to conflict. Bureaucratic Vs humanistic value systems (Chris Argyris). 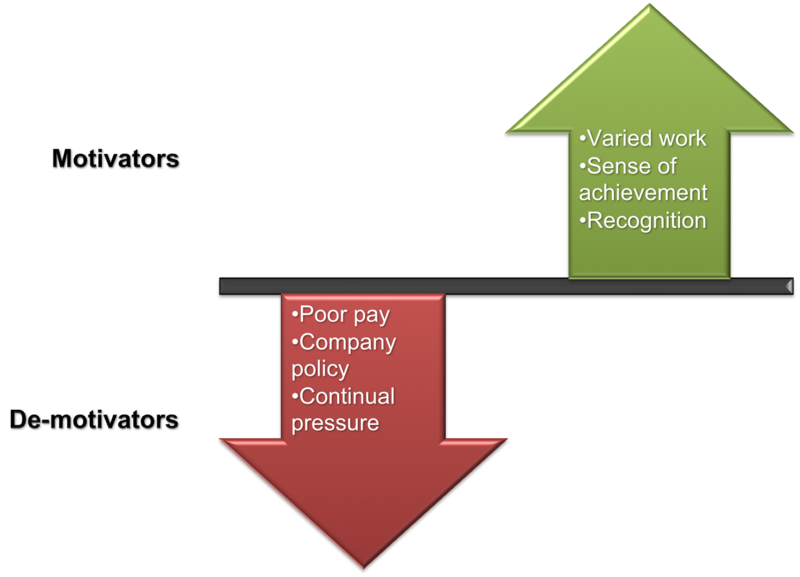 Bureaucratic / pyramidal organisational values dominate most organisations (the equivalent to McGregor’s Theory X); relationships in this environment result in decreased interpersonal competence, fostering mistrust; intergroup conflict and leading to a decrease in success in problem solving; Humanistic values lead to trusting authentic relationships and improve interpersonal and intergroup cooperation. You can judge for the number of theories outlined in this paper motivating people is a complex issue. Our White Papers on motivation and leadership try to bring these theories into a practical perspective (see WP1048 Motivation and WP1014 Leadership). This post also supports two of the key themes in my latest book, Making Projects Work are leadership and motivating your stakeholders to help you help them by delivering a successful project. The book is based on the premise that effective motivation requires focused communication within a robust relationship. New article: Stakeholder’s Don’t Understand Numbers! The PGCS is designed to make the connection between organisational governance and project controls. Project controls cannot operate effectively without the protection of senior management. Frank and fearless reporting of status and issues cannot be assumed if the middle levels of management have the capability to restrict negative information. Conversely, executive management decisions depend on accurate and realistic assessments of risk, schedule and cost. Creating a culture where this type of information is not only available but accepted and used properly is the key governance issue within the project, program and portfolio domain. 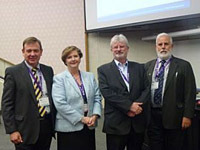 To facilitate this objective, the PGCS invites prominent international and Australian speakers to its annual conference, and then works to build connections and make the knowledge available through both personal contacts and the resources section of the www.pgcs.org.au website which now has all of this years presentations uploaded. You may have missed the Symposium, but you, and everyone on the project controls and governance communities are invited to make use of this resource, join in the conversation, and start planning for the 2016 Symposium, scheduled for the 11th and 12th May 2016. When it comes to effective communication, a clear, concise and easily defined name for something is essential if you want people who are not directly involved in your special disciple to understand your message. Jargon and ambiguity destroy understanding and damage credibility. There are four generally recognised focuses within the overall domain of ‘project management’ Portfolio management, Program management, Project management and the overarching capabilities needed by an organisation to use project, program and portfolio (PPP) management effectively. The starting problem is implicit in the above paragraph, ‘project management’ can be used as a ‘collective noun’ and mean all four areas of management or specifically to mean the management of a project. The next problem is if project management means the management of a project, exactly what is a project? The current definitions for a project are very imprecise and can apply to virtually anything. A more precise definition is discussed in Project Fact or Fiction. Program management is fairly consistently defined in the literature and involves both the management of multiple projects and the realisation of benefits for the organisation. There are still legacy problems though; the ‘Manhattan Project’ to create the first atomic bombs during WW2 was a massive program of work involving dozens of separate projects. Similarly, Portfolio management is fairly consistently defined. The core element of portfolio management is deciding on the best investment strategy for the organisation to meet its strategic objective through investing in new selected projects and programs and reviewing current ‘investments’ to ensure the project or program is continuing to deliver value (and closing those that are not to redirect the resources to a better ‘investment option’. Both Program management and Portfolio management are relatively new concepts and have the advantage of being developed at a time where wide reaching communication was relatively easy allowing a consistency of though and definition. Where the real problems emerge is in the realm of the overall organisational capabilities to use PPP concepts effectively. In general terms this area of management responsibilities can be picked up if ‘project management’ is used as an overarching term. Some times, some aspects get absorbed into people’s definition of portfolio management and program management. But this ‘absorption’ does not really help develop clarity; for example, whilst benefits realisation is generally seen as part of program management, this does not help deal with the realisation of benefits for the 1000s of project that are not part of a program, etc. Apart from project, program and portfolio management as defined I believe the global project management community, including academia and the major associations need to make a focused effort to develop a ‘standard’ naming convention for these various aspects of ‘project management’ – if we cannot be consistent in our use of terms our stakeholders will be permanently confused and confused stakeholders are unlikely to be supportive! The first is governance. 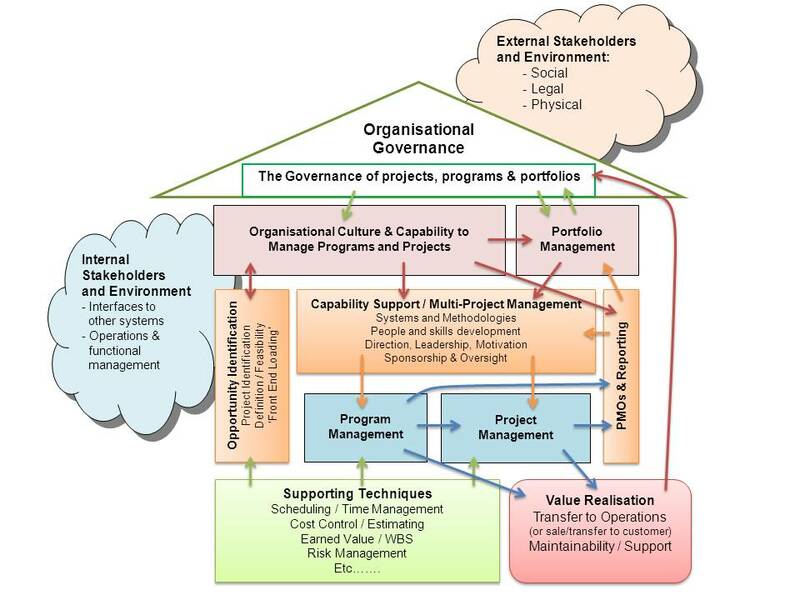 The role and function of governance in the PPP domain was outlined in Patrick Weaver’s recent presentation to the Project Governance and Controls Symposium in Canberra: Stepping up to Governance – the development of ISO 21503. The second is the ability of an organisation to effectively select and support its project, program and portfolio management efforts. This includes the ‘management of projects’, organisation enablers and multi-project management: The Strategic Management of Projects. The third area is the link between PPP, operations, strategy and value, encompassing benefits realisation, value creation and integration with organisational change management (which is an already established management discipline). I don’t have a good name for this critical area of our professions contribution to organisations but it is probably the most important from the perspective of executive management. The challenge is to start moving towards a consensus on a naming convention for these aspects of ‘project management’ so we can start communicating clearly and concisely with all of our stakeholders. Hopefully this post will start some discussions.